Welcome to Season 8, Episode 13 of the This Is Your Life podcast. 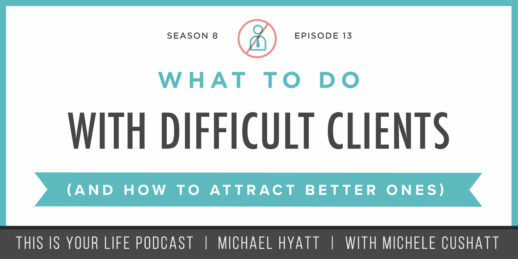 In this episode, Michele Cushatt and I discuss what to do with difficult clients. If you’ve ever been in a service-oriented business, you have likely dealt with the “high maintenance client.” This is the person who has unreasonable expectations and is often demanding, unrelenting, and never satisfied regardless of how hard you work to meet their expectations. In today’s podcast, I give you practical advice on how to handle these situations.